Winger Josh Charnley scored twice on his debut as Warrington came from behind to beat Widnes comfortably at the Halliwell Jones Stadium. Toby King also scored two tries and Sitaleki Akauola and Ben Westwood both crossed too as Wire ran in six tries. Winger Ed Chamberlain (2) and Rhys Hanbury scored for the Vikings. 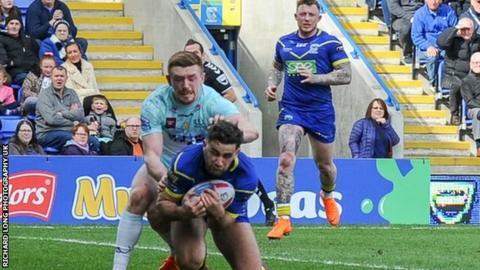 Charnley, on his first appearance back in league after moving from Sale, helped Wire recover from 10-0 down for a 10th straight win over the Vikings. After soaking up early pressure, Widnes struck with their first real attack on 12 minutes, when some crisp passing between Tom Gilmore and Charly Runciman allowed Chamberlain to squeeze over in the left corner. Another Runciman pass out of the tackle gave Chamberlain the tightest of spaces in which to score again, Krisnan Inu landing a fine touchline conversion before the Wolves roared back to level with two tries in three minutes from King. Tyrone Roberts' magical pass set up King's first try on 28 minutes and, three minutes later, the centre was first to Kevin Brown's grubber kick to claim a quickfire double. Bryson Goodwin added one conversion to level matters at 10-10, only for Inu's penalty to edge the Vikings back in front 12-10 at the end of the half. Wire then led for the first time just a minute after the restart when a succession of defensive errors allowed former Wigan flier Charnley to race over in the corner from 20 metres out. Akauola's powerful 20-metre charge to the line was followed by another accomplished finish in the corner from England international Charnley. Westwood secured victory 12 minutes from time, only for Widnes to have the last word with Hanbury's late try, Gilmore adding the extras. "They were two great finishes for Josh, two outstanding tries and not many wingers would have scored them. He's a special player and that's why we have brought him to the club. "He got the service he requires in the second half, there were a couple of opportunities in the first half, but it's a new centre and wing combination so it will take time. "But he got the opportunities in the second half and they were outstanding finishes." "I'm disappointed, we just wasted too much energy in the first half. "At one stage it was something like 17 sets to nine and even though the scoreboard was in our favour it was only a couple of chances we had in their half. You can't win a game of rugby league when you are that far behind with the ball. "We never gave ourselves a chance, the starts to both halves were really painful for us, especially the second half when we conceded a try. "It was a battle of energy and we lost it because of how much work we had to put in during the first half." Warrington: Ratchford; Lineham, Goodwin, T King, Charnley; K Brown, Roberts; Hill, Clark, Cooper, Currie, Hughes, Westwood. Interchanges: Philbin, Murdoch-Masila, Akauola, Smith. Widnes: Hanbury; Marsh, Inu, Runciman, Chamberlain; Mellor, Gilmore; T Chapelhow, Heremaia, Burke, Dean, Wilde, Houston. Interchanges: Johnstone, Olbison, B. Walker, Dudson.